If you run IBM i on IBM Power Systems, this will hopefully come as a friendly reminder. IBM has discontinued hardware support on POWER6 machines, followed by end of support for POWER7 at end of Q3 2019. You can find details on servers affected by the service discontinuation in the below announcement. Services withdrawal: Declaration of a plan to discontinue lease, rental, and maintenance services for selected machines IBM United States Withdrawal Announcement 917-163 – September 19, 2017. 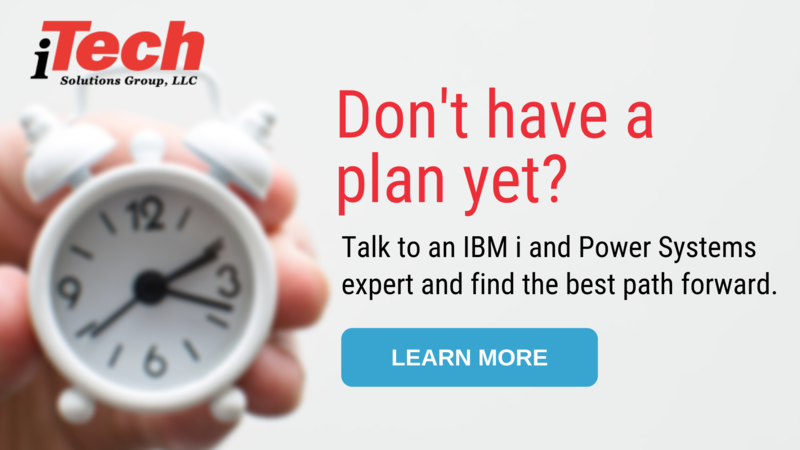 For the folks still running on older P6 and P7 machines, it is important that you make a transition to newer POWER8 and POWER9 systems or find other ways to adapt. Companies who plan on taking a reactive stance on this will be exposed to greater security and reliability risks after support is removed on these machines. If you are sitting on old hardware you must find new ways to ensure these systems continue running reliably. For IBM i shops running smaller workloads on a single POWER6 licensed IBM i core, you may be thinking IBM’s decision to discontinue service is ridiculous. It may even feel like you signed the paperwork for your P6 machine just a few years ago. My first question is always, “IBM i years or calendar years?”. I say this half-jokingly. Based on many of my conversations with IBM i shops, “a few years ago” tends to actually be more like six to eight years. We also have to understand that IBM i is not the only hardware manufacturer that discontinues support on hardware. For example, HP released the HP DL380 G7 server on 7/2/2010, withdrew it from marketing on 4/30/2013, and it hit EOSL (End Of Service Life) / EOL (End Of Life) on 4/30/2018. That is a life cycle of roughly 7 years and 10 months. You will see in the below chart that every one of the IBM Power servers exceeds the lifespan of the DL380 G7. Unfortunately, many companies are unsure of what steps to take to ensure a hassle-free transition with minimal downtime, or what those steps will cost. With the first round of hardware service discontinuation coming up 3/31/2019, iTech Solutions Group has developed several options for clients impacted by these end of life deadlines. We are the premier IBM i focused infrastructure solution and services organization and have a full portfolio of solutions and services to help you through the process. With IBM I in the Cloud Hosting, there is no capital expenditures for buying new hardware and software. You’ll be able to eliminate the need to manage backups on a daily basis and focus more on growing the business versus managing your IBM i. Need a more resilient IBM i environment? We can include full HAaaS (High Availability as a Service) within our iIntheCloud solution portfolio. I explained this a bit under the “Make the move to POWER9” section. Our expert IBM i engineers can help you get comfortable with the process. If you need more than just our word that we can get you upgraded to 7.2 or 7.3, we can also complete an iTech IBM i Upgrade Feasibility Test on our IBM Cloud infrastructure.